Create a bedroom retreat that reflects your contemporary style with this panel bed. A low-profile style frame with tapered block feet establishes a modern silhouette, enhanced by the sleek Glossy Black finish. Vertical line molding on the headboard adds a linear element for a refined touch. Capture the sleek simplicity of contemporary style with this sophisticated panel bed. The Hudson Queen Panel Bed with Tapered Block Feet by Lang at AHFA in the area. Product availability may vary. Contact us for the most current availability on this product. 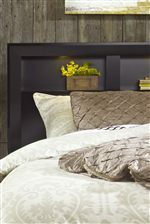 HUD-55-HB10-Q Full/Queen Panel Headboard 1 65" 3" 49"
HUD-55-FB-Q Queen Footboard 1 65"
Sleek, simple, and sophisticated, the Hudson bedroom collection perfectly captures upscale modern style. 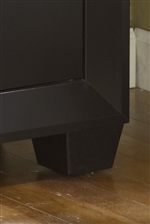 A Glossy Black finish offset with metal linear drawer pulls exudes contemporary minimalism. Tapered block feet, beveled accents, and clean lines establish sophisticated silhouettes, while drawers in most pieces ensure ample storage space. Multiple bed options allow you to pick the perfect piece for your personal taste, whether you prefer the sleek lines of the panel bed or adore the lighted compartment spaces in the Shadow bed. Capture the sophisticated simplicity of contemporary decor with the chic modern look of the Hudson bedroom collection. The Hudson collection is a great option if you are looking for Contemporary furniture in the area.